By admin on July 24, 2012 Comments Off on Not Our Ashley Byrd! “That is not our Ashley Byrd,” the answer given by Anne and Buzz Byrd of Edgefield, parents of “our Ashley Byrd” who grew up on Buncombe Street in Edgefield. They got a number of calls, as did her aunt Beth Byrd, asking, when did Ashley become director for the Miss South Carolina pageant? 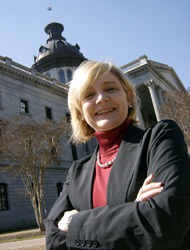 “Our Ashley” does hold a distinguished title for her job at South Carolina Radio Network. She is News Director, and can be heard not just in Columbia, but on the wire from Augusta and Johnston, sometimes during the news hour. Ashley began her radio career working college summer breaks for a radio affiliate to the SCRN. She got her degree in Political Science at USC and has won national and state recognition in every medium, including a national EMMY nomination. Ashley is a 1981 graduate of Wardlaw Academy in Edgefield County.